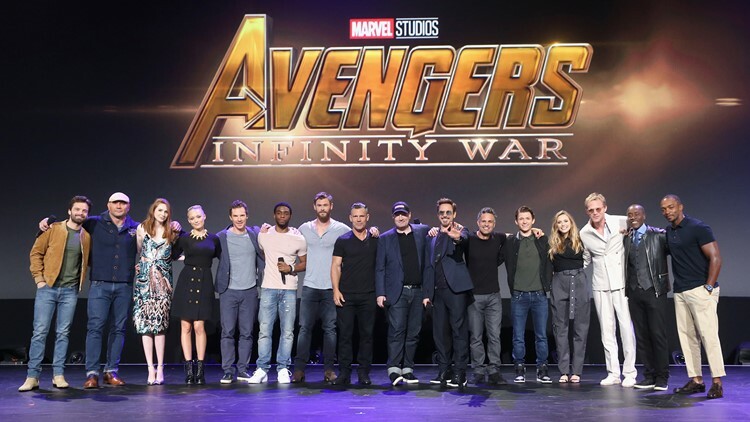 Avengers: Infinity War actors took part today in the Walt Disney Studios live action presentation at Disney's D23 EXPO 2017 in Anaheim, Calif. Fans have been waiting for 'Avengers 4' since the crazy cliffhanger of 'Infinity War,' and now they have a trailer to salivate over until next April. Are Black Panther and Spider-Man really dead? Is Iron Man still stuck in space? Is Captain America really saying goodbye? And who's gonna give Thanos the major whuppin' he deserves? Returning for the latest "Avengers" is the original crew of Robert Downey Jr. (aka Iron Man), Chris Evans (Captain America), Chris Hemsworth (Thor), Hulk (Mark Ruffalo) and Black Widow (Scarlett Johansson), plus newer heroes such as Ant-Man (Paul Rudd) and Wasp (Evangeline Lily). As for apparently departed good guys like Black Panther (Chadwick Boseman), Spider-Man (Tom Holland), Doctor Strange (Benedict Cumberbatch) and Star-Lord (Chris Pratt), well, we're hoping for the best.